I will not tolerate your harassment. I will not be subject to electronic bullying. If you are unhappy with the blogs I have written about your “book,” then maybe you should be more forthcoming in your claims. The book I reviewed was not based on real stories. Instead, you made up stories in hopes of selling more copies. This is unethical and amoral. Please refrain from complaining, again, about my writing. 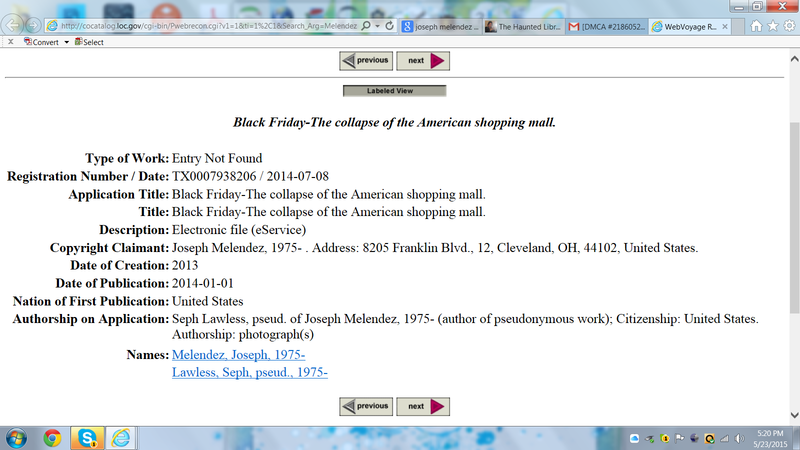 Last year I wrote several blogs discussing the amoral behavior of Joseph Melendez, who goes by the pseudonym Seph Lawless. Joseph self-published a book titled 13: An American Horror Story. I took exception to his claims that his stories were fictional—made up. Joseph purported to lots of media outlets that his photographs depicted abandoned houses where heinous crimes were committed. The media ate it up. None of them actually fact-checked the stories. If they had, they would have found out that every story was made up. A lie. — BEGIN NOTICE — First name: SEPH Last name: LAWLESS Company name: Address: 8205 FRANKLIN BLVD. City: CLEVELAND State/Region/Province: OHIO ZIP: 44102 Country: United States (US) Phone number: [redacted for privacy] Email address: INFO@SEPHLAWLESS.COM Copyright holder: UNITED STATES COPYRIGHT OFFICE LIBRARY OF CONGRESS Location of unauthorized material: https://thehauntedlibrarian.com/2014/11/15/missing-a-haunted-house-or-2-or-3-or/#comments Location of original materials: https://thehauntedlibrarian.com/2014/11/15/missing-a-haunted-house-or-2-or-3-or/#comments Description of original materials: THE IMAGE OF HOUSE IS MY COPYRIGHT IMAGE. THE BLOG USES NOT ONLY THE IMAGE BUT IS ABUSIVE, SLANDEROUS AND USES DEFAMATION IN BLOG AS WELL. Note: I redacted his telephone number for privacy. I take exception to this because the blogs are not abusive or slanderous. I wrote the truth. My blogs are covered under the Fair Use Exception of the U.S. Copyright Law, http://www.copyright.gov/title17/92chap1.html#107. I criticized his work and he didn’t like it. Well, tough. Don’t tell lies. Another Note: Interesting enough was the link Joseph provided. It was to another one of his books and not the one I blogged about. Oh my stars! Morals of this blog: 1) WordPress rocks! They supported by blog. 2) Writers, bloggers, and photographers need to unite to end this type of behavior. I commend your bravery and integrity in standing up to this harassment and abuse. You’re not alone in dealing with it and I applaud you sticking to your position. Thank you for taking a stand against this notorious internet bully. He, and his business model, cannot stand criticism and he viciously attacks anyone who would threaten that. He has built an elaborate house of cards and is terrified that it will get knocked down. This is by no means the first time he has lashed out against people, always using bogus copyright claims (and lawsuit threats he never follows up on because he has no case) and fake accounts hurling insults. He is a 40 year old child. I thought long and hard on this one. People need to read about his antics and hissy fits. Thank you so much for posting this. There is a great community of photographers and explorers that are supportive of each other and are passionate about what they do without having to lie about the locations they shoot or about each other. He is an embarrassment to the community. Instead of threatening people with lawsuits he should put the work in and create a better product. Yes, he is an embarrassment. Seph Lawless has always been a self aggrandizing weirdo who makes lofty claims about places he shoots that plenty of people have photographed before him. He tries to make himself out to be some activist / artist who believes in freedom of speech, yet tries to shut down everyone who points out mistakes in his work. In reality, he is just a guy with an iphone, low grade camera equipment, self published books with the bare minimum of work put into them, a tower of lies, and some greasy hair. Yes, please check out the radio show. The second and third episodes will be about Through the Veil, an event about metaphysics and spirituality, http://www.throughtheveil.org/. There is no way the comments here from “Blair” aren’t seph lawless aka joseph melendez. while seph and others are here i might address a few things… he bought almost all of his likes, he once lost about 44k instagram followers in one day. if you check the likes on any one of his facebook posts they are all names you can’t pronounce, this is because he buys them from clickfarms in third world countries. he claims certain houses were demolished years before the lens he even shot them with was released. he claimed rabbit poop on a pet gravestone was food left their by the owner 20 years earlier. he claims a double murder happened in a house he photographed in texas, when in fact it happened in a car. literally every place he photographs is given the title “the most haunted _____ ever” which couldn’t be further from the truth. oh, most importantly, he has been arrested about a dozen or so times, which is probably why he came up with the fake name. it isn’t hard to find those records. My, my, my. Seems 4 of the responders, now blocked, were in fact coming from the same IP address. Multiple personalities? I think not. Looks like another Seph Troll account. How would Matthew harass you over wordpress comments? Quit while you are behind Joseph. If you wish to respond to any blogs related to Joseph Melendez and/or Seph Lawless, you will need to provide proof of identity. Comments will be verified. This may take a bit of time because it’s summer and I’m on vacation. Many thanks! I have seen him put down and belittle other photographers who share the urbex passion. He insulted us by saying that we use certain tags only to gain likes, and that he is so much better than us, because he is trending and going viral. He claimed his photographs of a particular location were the only ones to exist, and when shown that this was untrue, became defensive and proceeded to block all of us from his photo-sharing accounts. The story goes very deep indeed. Only by openly discussing his inappropriate behavior will we be able to contain–possibly stop–it. Thanks for sharing!